WHAT IS GUM DISEASE OR PERIODONTAL DISEASE? The most common reason for tooth loss is gum disease or periodontal disease. Often, patients exhibit no symptoms during the early stages of gum disease. 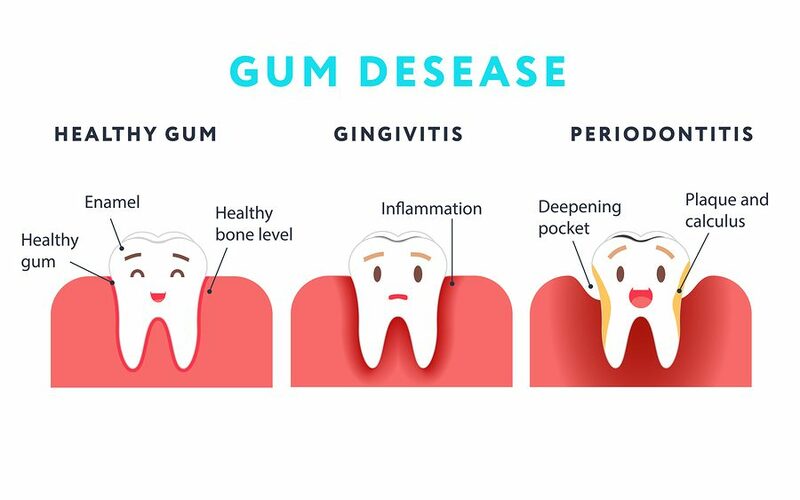 However, gum disease can be characterized by bleeding gums, red gums, swollen gums, receding gums, shrinking gums, gum abscesses, gum boils, gum pain, lack of gum pain, loss of bone support, and/or loose teeth. Teeth that have been damaged by gum disease become infected and painful and must be extracted. Gum disease or periodontal disease is preventable. It is caused by poor oral hygiene. Brushing twice a day and flossing at least once a day in conjunction with at least twice a year professional cleanings will usually prevent the gum disease process from beginning. However, once the destructive process has started it is very difficult to stop. Gum disease can not be reversed. Our best hope is to stop it from getting worse – or to prevent it from beginning. Periodontal disease or gum disease is not contagious. You can not get gum disease by kissing someone. It is caused by a lack of flossing and poor brushing. Some people are more susceptible to gum disease due to genetics. Daily flossing and brushing can still prevent gum disease, even for those who are genetically predisposed to getting it. About 80% of adults will have gum disease at some point in their lifetime. It is far more common than you think. If you have any signs of gum disease, call Shamblott Family Dentistry TODAY at 952-935-5599 for a FREE new patient exam and x-rays (panoramic and bitewing). Gum disease in its early stages is often painless and invisible. Left untreated, gum disease always results in the loss of teeth. By the time gum disease becomes painful, it has usually taken hold of the mouth. Once that happens, patients either face extraction of their teeth or time consuming, expensive treatment. It is easier to prevent gum disease from developing in the first place by daily brushing and flossing than to end up losing teeth and needing dentures. Once diagnosed, gum disease must be treated immediately and aggressively to control it and prevent it from getting worse. Gingivitis is a precursor to gum disease. If left untreated, gingivitis will turn into gum disease. It is characterized by swollen, red and irritated gums without any destruction of bone. Depending on the amount of tartar or calculus present, treatments range from a regular cleaning or prophylaxis to a full mouth debridement. A full mouth debridement, followed a short time later by a second cleaning, will promote initial healing. Then we can accurately asses the condition of your gums. A full mouth debridement will improve the condition of your gums so that you can clean the base of the pockets or sulcus. Most of the time, gingivitis is successfully treated by a full mouth debridement and follow up fine scale appointments. Excellent daily brushing and flossing complete the treatment for gingivitis. Every tooth in your mouth is made of two parts: the crown and the root. The crown of the tooth is the part of your tooth that appears above the gumline. The root of the tooth is below the gumline and is attached to your jaw bone by the periodontal ligament. At the top of the gumline is a little pocket that forms all the way around each tooth. This pocket or sulcus is what is measured in the dentist office to determine if you have gum disease, and to judge the severity of your periodontal disease. Plaque is a sticky yellow film that accumulates on teeth. It is made of bacteria, not food debris, and is toxic. The bacteria are fed by the foods and beverages you consume. As the bacteria break down their food, they excrete toxic waste products called endotoxins. The endotoxins are excreted into the pocket around your teeth causing the gums to become red and inflamed and to bleed easily. This is called gingivitis and it is the first stage of gum disease. Gingivitis is easily reversed with daily flossing and twice a day brushing. If brushing and flossing is able to remove the toxic waste products, the gum tissue will heal within a few weeks. If the gingivitis and bleeding gums are not treated the destructive process will continue, leading to the next stage of gum disease, bone loss. As the amount of toxins in the sulcus or pocket grows over time, the bone supporting the teeth starts to shrink away to protect the body from the infection in the pocket. The receding bone makes the pocket around the tooth even deeper, making it nearly impossible to clean without the professional help of a dental hygienist. Over time, the plaque will harden and is now called tarter or calculus. This becomes a vicious cycle of the tarter and calculus causing the bone to shrink away, making the pocket deeper and deeper, making it harder to remove the tarter and calculus. As the bone support around the teeth is destroyed, the teeth start to become mobile or loose. When the teeth become sufficiently loose, biting and chewing pressures will cause them to drift, or move. Bruxism, or clenching and grinding, can aggravate the effects of gum disease. At this stage the only option available is extraction. Various options are available to fill in the missing spaces depending on the size of the space, the condition of the surrounding teeth, and your budget. Options include bridges, partials, dentures and implants. One by-product of the bacteria that cause gum disease can be bad breath, or halitosis. Treating the periodontal disease will improve your breath. Gum disease is caused by poor brushing and flossing. The rate of destruction of bone supporting the teeth can be influenced by the overall health of the patient, genetics, and the amount of clenching and grinding a patient does. Diabetes is a disease in which the body does not produce or properly use insulin. Insulin is a hormone that is needed to convert sugar, starches and other food into energy needed for daily life. Patients with uncontrolled or poorly controlled diabetes are prone to more aggressive forms of periodontal disease with rapid bone loss. Diabetes may weaken your body’s germ fighting powers and high blood glucose levels can make gum disease worse. At the same time, gum disease can make blood glucose levels harder to control. With early to moderate gum disease, some bone loss or bone destruction has occurred and the gums are swollen, irritated and bleed easily. In early gum disease, the bone destruction is localized and the pockets around the teeth are less than 5 mm deep. In moderate gum disease, the damage to the bone is more widespread throughout the mouth and the pockets are up to 7 mm deep. For any form of gum disease, the first part of treatment is the thorough removal of all tarter, calculus and plaque from the root surface. Root planing is the name for the cleaning of tarter, calculus and plaque off of the root surface in the deeper pockets of early and moderate gum disease. To make root planing more comfortable, Novocain or local anesthesia is used. Root planing and excellent brushing and flossing will cause the pockets to shrink. However, the pockets rarely shrink back to normal. Localized antibiotic therapy may also be used. Because floss will not reach the bottom of the pockets, special devices are needed in addition to brushing and flossing. These supplemental devices may include Proxabrushes, water picks, rubber tips, Sonicare toothbrushes, and more. If brushing, flossing and supplemental devices are not successful in controlling your gum disease, gum surgery may be necessary in addition to regular professional cleanings. Severe gum disease is different from moderate gum disease in that the bone loss is much greater. With severe gum disease, the bone loss creates pockets in the bone around the roots of the teeth. This leaves very little bone supporting the teeth, so your teeth become mobile or loose. Treatment for severe gum disease begins with root planing and may include localized antibiotic therapy. With root planing, antibiotics, regular professional cleanings, excellent brushing and flossing and supplemental cleaning devices, even severe gum disease can be controlled. Gum surgery or extraction may be necessary if this condition continues or worsens. Some medications will cause the gum tissue to become overgrown. This condition is known as gingival hyperplasia. Examples of medications that can cause this to occur include Dilantin (used to treat seizures in epileptics), Cardizem (used to treat high blood press), birth control pills, Progestogen (used for hormone replacement), and Cyclosporine (used as an immunosuppressive agent. Treatment for this condition includes gum surgery to remove the extra gum tissue, followed by daily brushing and flossing. Daily brushing and flossing can greatly minimize the effects that these medications have on the gums. In the worst cases, the combination of these medications with poor brushing and flossing can cause tremendous overgrowth of the gums, to the point where the teeth are completely covered by gum tissue. Always use a soft bristled toothbrush. A soft toothbrush is more effective at removing plaque from your teeth because some bristles will bend and clean the pocket of gum tissue around the tooth. Overly aggressive, vigorous brushing can cause damage to your teeth. This is avoided by using short, light strokes with the toothbrush. Hold the toothbrush at a 45 degree angle to the gumline. Move the toothbrush back and forth with short strokes. Start on the lip or cheek side of the teeth and move all the way around your mouth. Come back on the tongue side of the teeth. Next brush the biting surface of the teeth. After completing the lower teeth, repeat the process with the upper teeth. The entire process should take at least two minutes.